A time to renew old bonds and build new ones, BGI Freshers enables this fostering of an endearing relationship with the new entrants of the family. As always, a fun fiesta was organised by the seniors of the institution to welcome the newcomers of the Engineering College on the 10th of September, 2018. 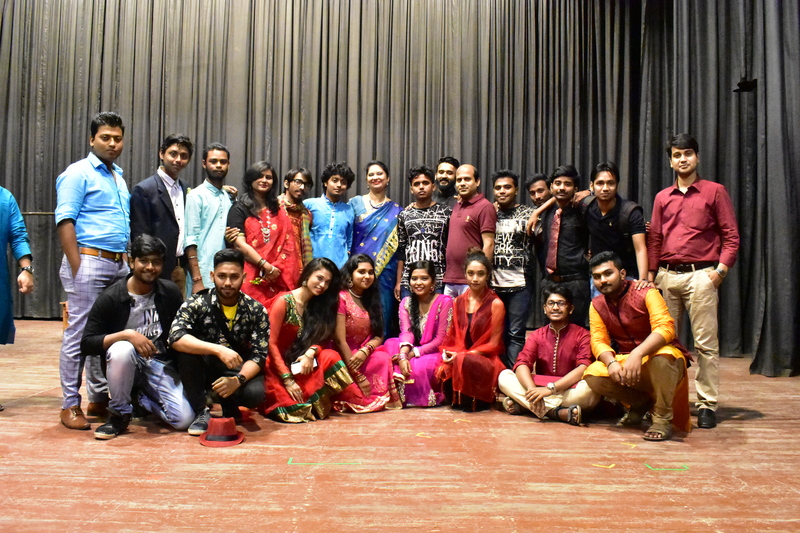 It was a cultural programme arranged by the students of all the Engineering and Management departments to fill the day with joy and merriment for the juniors. Inaugurated by the Principal of Brainware Group of Institutions, Dr. Subhasish Banerjee, the function included several commendable performances like music recitals, dancing, drama and such other activities. Attired in bright clothes, the first years had a memorable time cheering the performers and interacting with their seniors, establishing a close bond with them. Brainware Group of Institutions has always emphasised on instilling among its students a spirit of fraternity and moral human values. The disastrous natural calamity that befell on Kerala as a result of ceaseless torrential downpour for a prolonged period of time caused enormous damage not only to life but property as well. Such a situation called for an immediate support from other states and fellow human beings. 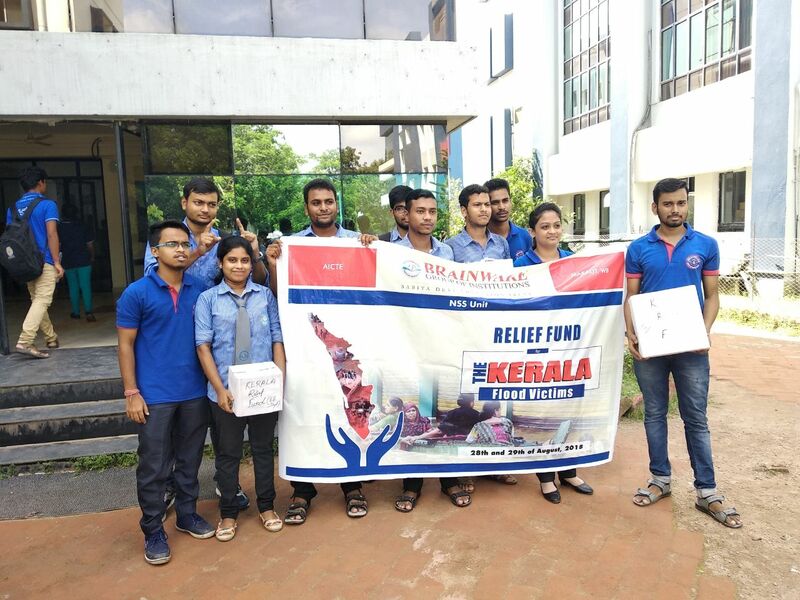 The students of our engineering college, exhibiting a sense of altruism and humanitarian concern, organised a Fund Collection Campaign and played an active role in assisting the victims both in cash and in kind. The amount collected was deposited to the Kerala Relief Fund for those unfortunate sufferers so that they could recuperate soon. It was a humble effort on the part of our students to stand beside the casualty. We hope their endeavours bring a little drop of happiness in their sea of sorrow. Brainware Group of Institutions has always played an active role in performing social services for the upliftment of the society at large. 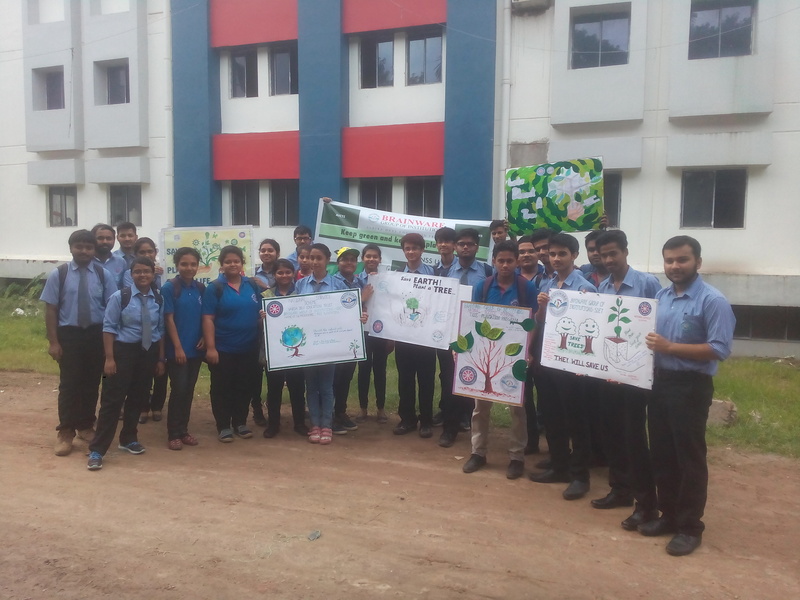 With the objective of making the environment greener and spreading mass awareness of the necessity of preserving trees, BGI organised an NSS Campaign on Tree Plantation. The participants of the events included students of the engineering college of several departments. The session began with the sowing of seeds and the planting of saplings in the barasat campus of the institution under the care and guidance of the faculty members. Thereafter, Prof. Dilip Debnath, Dean of Engineering, delivered presentation on universal human values to bring about a holistic development among the aspiring engineers. The campaign indeed benefitted one and all! 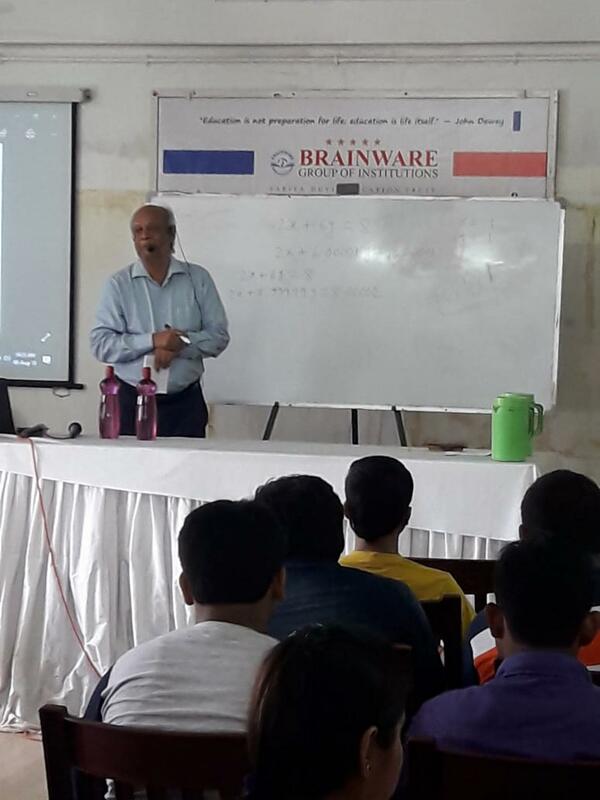 To welcome the students in their new journey of college life, Brainware Group of Institutions organised an Induction Programme that is scheduled to continue for the next few days. On 8th of August 2018, the first session of the programme was arranged on 'Introduction to Various Topics on Science and Technology' for all the five departments of engineering. The event was attended by the aspiring engineers of the first year who were addressed by the senior professors of the Engineering College, Prof. Nimai Chandra Das, Prof. Joydeb Hazra and Prof. Shyamal Kumar Bhattacharya. They delivered speeches on the course curriculum and the current trends in science and technology to motivate the young minds. Their words of inspiration and wisdom are sure to enlighten all the spectators present there. Brainware Group of Institutions celebrated National Youth Day on January 12, 2018, at its Barasat campus. National Youth Day is celebrated on the birth anniversary of Swami Vivekananda, the great patriot Hindu monk of India. He is still considered a youth icon for his revolutionary views. 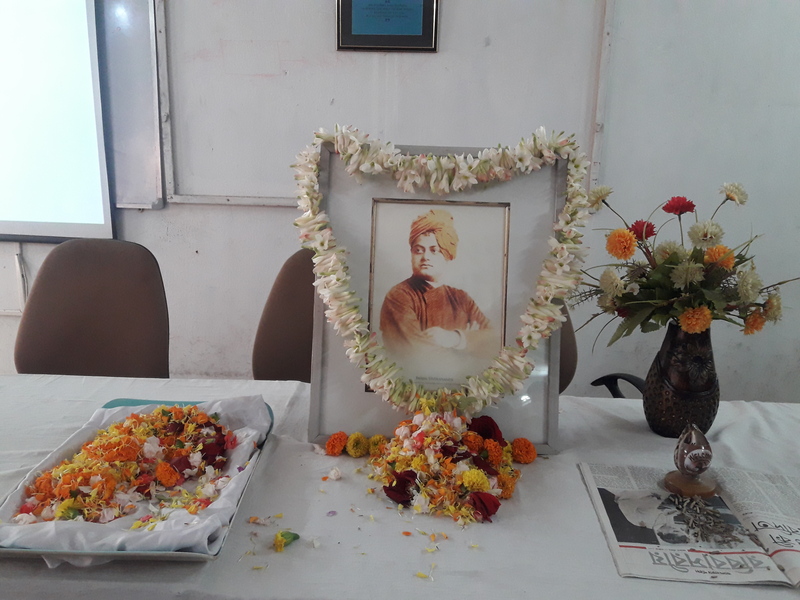 On that day, the teachers remembered the great saint and discoursed about his contributions to the society. 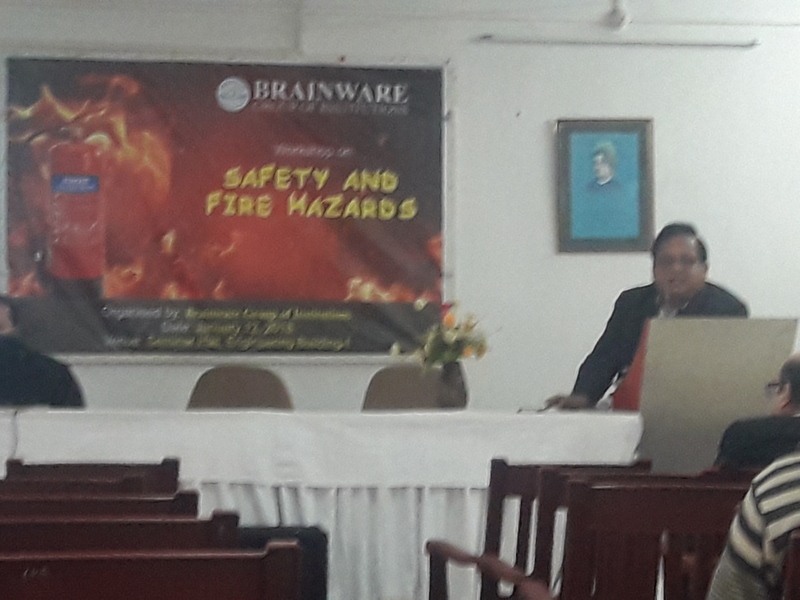 On January 12, 2018, Brainware Group of Institutions organized a workshop on Safety and Fire Hazards. Mr. Gopal Krishna Bhattacharya, the speaker for this occasion spoke to the students about the fire safety measures, and demonstrated how a fire extinguisher should be used. For the students of this institute, it was an important experience, and after the workshop, they became fully aware of how to deal with such unforeseen contingencies. Going beyond the curriculum and providing a deeper insight to its students has always been one of the salient features of Brainware Group of Institutions. With this intention, a seminar was organised by the 'Open Source Club' of the Department of CSE on the 1st of November, 2017. The symposium offered an 'Overview on Slack' and facilitated a hands-on experience on this technique. 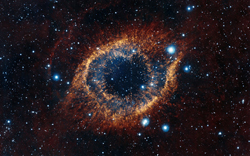 Abbreviated as 'Slack', it refers to "Searchable Log of All Conversation and Knowledge" and is a cloud-based set of team collaboration tools and services. It was indeed a beneficial session for the students. With an intention to offer something beyond the curriculum and thereby widen the future prospects of the students, Brainware Group of Institutions organised an NPTEL Awareness Camp on 9th and 10th of November, 2017. The event was attended not only by the present students of the Engineering College but also the ex-students. It was an inspiring session where the audience was motivated to take part in online courses and certification on various topics. It was indeed a unique initiative undertaken by the institution that benefitted one and all. Mixing education with fun and competitiveness, Brainware Communication Club organized Ad-Lib, the Intra College Open Extempore Competition on the 3rd of Nov, 2017. 75 participants who enrolled for the competition were divided into three batches of 25 each as they battled their wits out for the ultimate prize of a trophy, certificate and prize money. The President of the Brainware Communication Club Smt. Anandita Das opened the competition with her encouraging words and the strength of 75 was cut down to 30 after the 1st round. The 2nd round saw Sri Satyabrata Podder of the ME Department and Dr. Arpita Basak of the MBA Department join Mrs. Das in the judges panel as the strength was further cut down, to the final 15, who would now battle it out for the coveted trophy. In view of their creativity and innovative thought process, the committee decided to hand out two more awards along with the customary 1st, 2nd and 3rd, which were the Critics’ Choice Awards, one each for a male and a female. The grand final saw the Principal of BGI, Prof. (Dr) Subhasish Banerjee and Dr. Shyamal Goswami HOD of the ME Department take over the reins at the judges table. 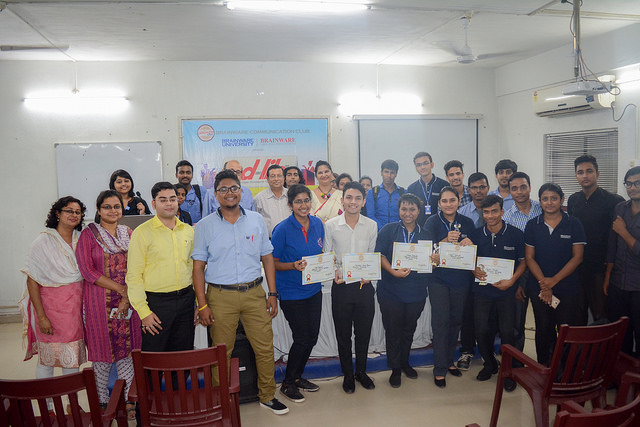 After an intense and brainstorming 45 minutes of oratory Pragna Debnath of the BCA Department, Nidhi Jaiswal of the ECE Department and Akashdeep Lama of the MCA Department were adjudged 3rd, 2nd and 1st respectively. The judges sought fit to hand over the Critics’ Choice Award to Anirban Mondal of BCA and Asmita Majumdar of Multimedia. We congratulate the winners and applaud all the participants for their heart, passion and determination. More than the disease itself, the taboos and prejudices concerning AIDS victims are dangerous. 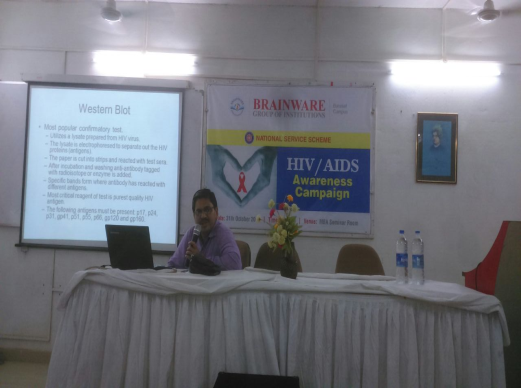 Brainware University, in collaboration with Brainware Group of Institutions organized an HIV/AIDS Awareness Campaign on October 31, 2017. The campaign was a part of the National Service Scheme. The Guest Speaker, Dr. Montu Lal Maity endeavoured to educate the audience, comprising of the students and staff of the aforesaid institutions, regarding the prevalent stigmas concerning the disease, so that awareness can be spread concerning the disease, and the need to treat such patients with fellow-feeling and sympathy. The solemn duty of an educational institution is not only to impart lessons pertaining to the subjects, but also to encourage its students to go beyond the syllabus, and engage in co-curricular activities. An all-round development of a student is only possible when his repertoire of knowledge increases with time. A curious temperament is the need of the hour. Brainware Group of Institutions began this journey of excellence on September 23, 2017 with the inauguration of a quiz competition on a large scale, ‘Inquisitive Minds’ in association with Career Launcher. 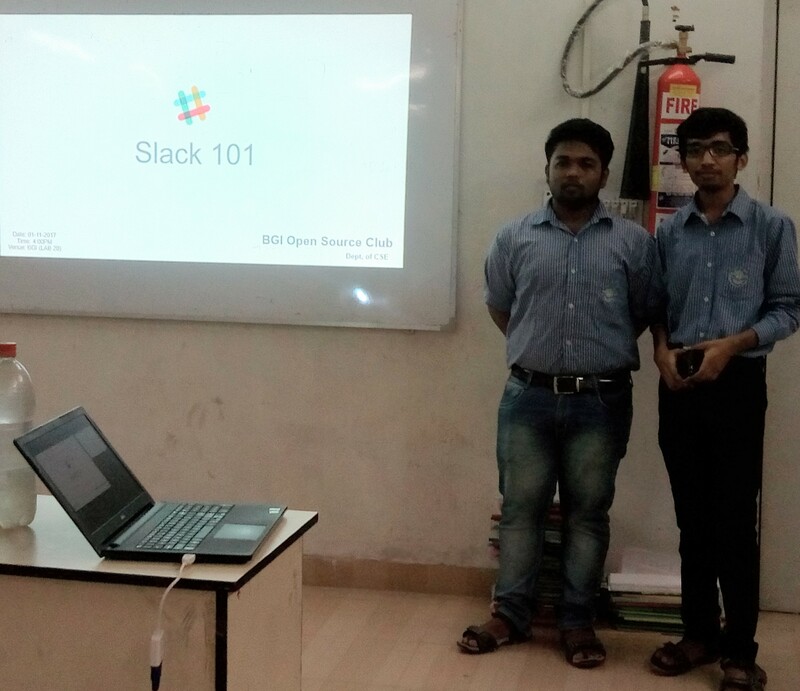 It was a step towards introducing the students to a competitive zone, towards instilling in them a spirit of enquiry.The journey culminated in the decisive victory of Mainak Chakraborty and Abhisekh Chakraborty, the 2 nd yearv students of B.Tech CSE of Brainware Group of Institutions. They overcame all the odds and after having faced stiff competition, emerged victorious in the finale held at Rotary Sadan, Kolkata on November 5, 2017. It was a proud moment for them as well as Brainware Group of Institutions which now hopes to organize similar programs, so that the students could not only increase their knowledge base but also allow themselves to express and test themselves in a competition and that so on such grand stage. Like the past years, this year too, the Department of Mechanical Engineering organised a Training Program on Ultrasonic Testing and Radiographic Testing, conducted on last semester vacation (June to July, 2016). This training program, which led to ASNT Level II Certification, was attended by the students and the faculty members of the Department as well as industry professionals. The certificate distribution program was held on 2nd Nov' in association with the Institution of Engineers (India), Students' Chapter. Mr. Sandip Moitra, MD, Moitra Metals graced the occasion as the Chief Guest. Prof. (Dr.) Bimal Chaudhuri, Director Projects of Brainware Engineering College, inaugurated the event observing, "Availabilty of the skilled human resources should be the key competitive advantage for India". In fact, This is why the department has been offering such courses during every summer and winter vacation. Prof. (Dr.) S Goswami, Director Research and Innovation and Head of the Department, discussed self-certification in industries. He stressed that Non Destructive testing, in addition to conventional material testing, has a profound impact on medical imaging like Electrocardiography, Ultrasonography, Digital Radiography and a wide range of other applications. A workshop on "PCB DESIGN PROCESS"
With the vision of achieving sound technical skill on various modern applications, a workshop on "PCB DESIGN PROCESS" will be organized by the department of Electrical Engineering, in association with OGMA TECHLAB, a training division of Ogma IT Conceptions Pvt. Ltd. The workshop has been tentatively scheduled on October 27th and 28th, 2016. Department of CSE, Brainware Group of Institutions organized a one day seminar on .Net technologies. It was held on August 19, 2016 in the college campus and conducted by Mr. Krishnendu Saha , Assistant Professor, Dept of Computer Science, Brainware University. All the students of B. Tech (CSE) Fifth Semester (Batch 2014 - 2018) have participated in this seminar which enriched the students by understanding the nuances of .NET. 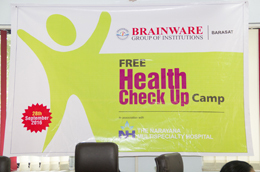 On the 28th of September, 2016, Brainware Group of Institutions, in association with Narayana Multi-speciality Hospital, arranged for a free health check-up for its staff at the Barasat campus. A team of highly competent doctors and nurses conducted blood sugar and blood pressure tests and ECG on all the willing volunteers from the staff. This event did not only mark a well-intentioned collaboration between Brainware Group of Institutions and Narayana Multi-speciality Hospitals, it also gave Brainware a chance to serve and care for its precious members in its own humble way. The department of Management hosted a seminar titled 'Relevance of Marketing Mix in Competitive Business Environment' at the Management Seminar Hall of Brainware University on 28th September, 2016. Prof Asok Banerjee, former HOD of Management IISWBM, was the guest speaker. Students of BBA and MBA as well as faculty members of the concerned departments are expected to be present. Brainware Group of Institutions proudly hosted a two-day tech fest 'TECHNITIATE' on its college campus, from 27th through 28th September. Dr. Ajoy Kr. Datta, the principal of the college, inaugurated the fest, while Mr. Phalguni Mukhopadhyay, Managing Trustee of Sabita Devi Education Trust, lighted the inaugural lamp. Students of all years, across 5 engineering streams-Civil, Mechanical, Electrical, Electronics and Communication, and Computer Science- participated. Participants of each department formed separate groups and showed their projects to teachers and visitors. Students and faculties from schools and other colleges also came down. Besides, intercollegiate competitions were also arranged. The central events included Robo Soccer, Terrain-o-mania, Codathon, Counter Strike, and Photography. Cash prizes were given away to the winning teams. 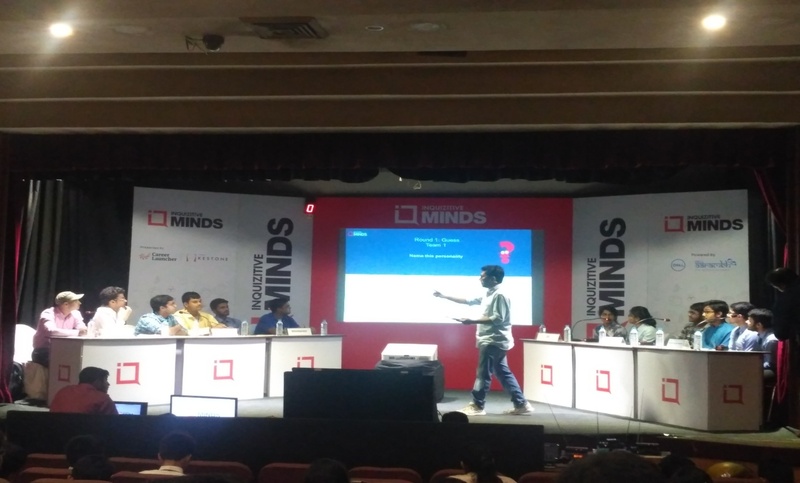 The engineering students of Brainware organized a tech fest on September 27th and 28th. It was inter college, bigger, better, more fun and challenging. There were 5 exciting events where imagination and creativity were unleashed. 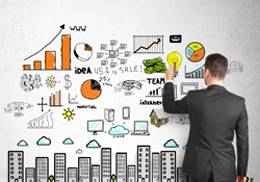 New ideas came up and technical prowess was demonstrated. Students also won exciting prizes. A group of students participated in the industrial visit under the able guidance of two faculty members and a Senior Professor. The Mechanical Dept. organised an industry visit on 29th April at Dwarkesh Engineering Works Pvt Ltd., Madhyamgram. Dwarkesh Group manufactures Centrifugal, Sand and Ceramic castings in Heat, Wear and Corrosion Resistant Steel and is certified by BCI as per ISO 9001:2008. The Institution of Engineers (India) is the national organization of engineers in India. The Institution of Engineers (India) has more than one million members in 15 engineering disciplines across 114 centers or chapters, in India and the overseas. The Institution of Engineers (India) was established in 1920 in Kolkata, West Bengal, and is acclaimed to have pioneered non-formal education in engineering. SDET BGI opened its students' chapter with this organisation for the benefit of engineering students. Students from all streams participated in this seminar and a majority of students became members. A two-day workshop on "PLC" was held on 22nd and 23rd April, in the BGI campus. Our students learnt the basics and the advanced levels of PLC. We were glad to find our students interested in this domain. A Workshop was held on Structural and Foundation Design by Wingfotech in association with Chemclave, 16, Indian Institute of Technology, Madras, which led to a National Level Competition and Championship (Utkraanti 2016). 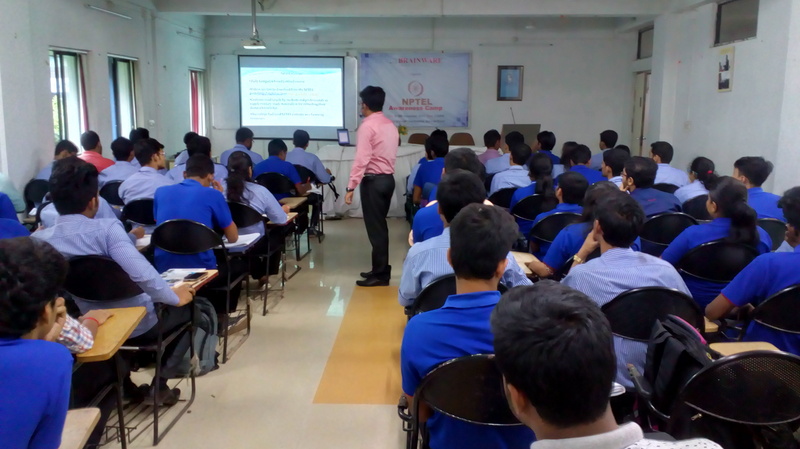 CMA in collaboration with The Calcutta Stock Exchange organized a financial literacy programme entitled “Student Financial Literacy Programme or Student Education Programme”. This was two – three hours of money-lessons classes to get students & faculty money-wise and money- smart with their personal finance. B.Tech Final Year students visited the Mangal Pandey Water Treatment Plant, near Barrackpore. A workshop was organized by the Department of Computer Science & Engineering in association with Ardent Computech Pvt. Ltd.
Seminar on Advanced Embedded System, Electrical Dept. A seminar was held on Advanced Embedded System on 30th January, 2016 at SDET, BGI campus. 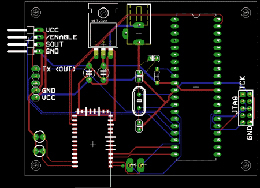 Our students learned the basic of advanced embedded system. They became familiar with the software as well as hardware application of the system. The students explored a new area of interest and discovered ample scope for future through their learning. Mr. Debdutta Guha, General Manager, MSME – TOOL ROOM KOLKATA had given a special talk on University Institution Interaction. It was attended by faculty members. We organised an 80 hours course as per SNT-TC-1Aof American Society for Non-destructive Testing (ASNT at the department of of Mechanical Engineering. Department of Electrical Engineering had organised a workshop on PLC in association with Ardent Computech Pvt. Ltd.
Department of Management had organised a Seminar on "The Role of Technology and Management in Emerging Business" Speaker: Mr. Santanu Sengupta, Managing Director, Britannia Engineering Ltd. Westingshouse Saxby Farmer Ltd. (W.B. Govt. undertaking). Six Awareness Programmes as projects under National Service Scheme (NSS) aimed at developing student's personality through community service: Plastic Free Zone, Health Awarness, Water Sampling and Testing, Computer Literacy, Save Water & Electrical Energy, Blood Donation.